Whilst many of our bakers are taking a well earned break from their daily toil in a steaming bake-house, us millers are hard at it carrying out maintenance to the mill and machinery. Windmills are rather like the Forth Bridge, a never ending list of maintenance tasks covering items both inside and outside the mill; no sooner have you completed the list and you have to start all over again! We carry out external maintenance during the summer whilst the weather, at least theoretically, is better. 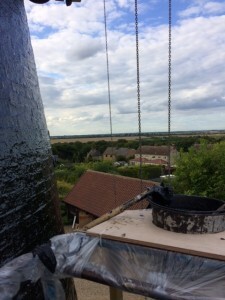 There is a window from the middle of May to the end of September when it is best to complete sail and fantail painting as well as tarring the mill tower. This year, all those tasks have been tackled. 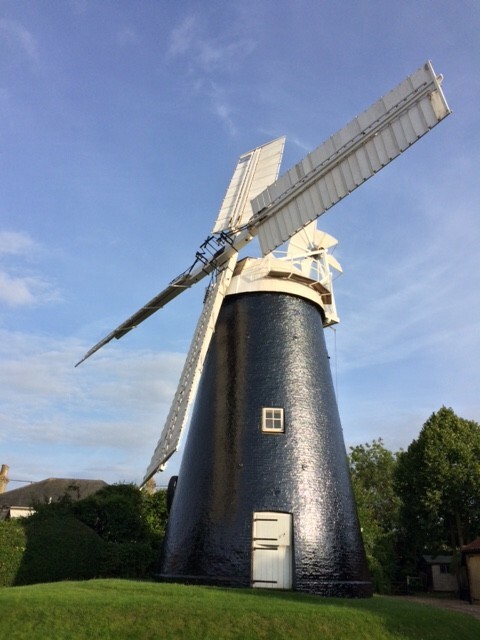 The mill fantail and fan frame has had a new coat of paint, the metal gallery rail around the top of the mill has been stripped down and re-painted. Lastly, the mill tower has received a thick, shiny coat of coal-tar. 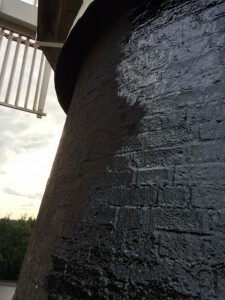 Coal tar is the traditional material used to keep the tower weather-proof. This is a filthy job as the tar is very sticky, hazardous to apply and lethal to white paintwork. As a result, we take great precautions to protect the windows and doors of the mill, ensure all vehicles are removed down-wind of the mill and don protective breathing apparatus and suits to apply the tar. We use a cherry-picker to gain access to all areas of the mill tower. The result is worth the hard work – a bright, shiny ‘bling’ mill tower which glints in the sunshine and keeps the rain out to boot! Take a look for yourselves! We treat your email address with the utmost respect. We promise we will never spam you or sell your details on.